The SQL Case Statement is similar to the control flow statements (something like IF ELSE). This evaluates the series of conditional expressions provided in CASE WHEN, and returns the result set. Simple Case Statement: The simple case statement compares the input_expression to a series of test_expressions followed by the WHEN keyword. Once it found the match, Case statement will return the corresponding result_expression followed by the THEN keyword. If there is no match then, Case statement will return the default_expression. If the condition is TRUE then Case statement will returns corresponding result_expression followed by the THEN keyword. Input_Expression: Please specify a valid expression that you want to check. For instance, it may be any column on which you want to perform CASE operation. test_expression: You have specify a valid expression. CASE statement will compare the value, or an expression against the Input_Expression, and if it TRUE result_expression will be returned. result_expression: Please specify a valid expression. If the test_expression is equal to Input_Expression then this expression value will be returned as output. If they are not equal then default_expression will be returned as output. Boolean_expression: Please specify a valid Boolean expression that you want to use in searched CASE operation. In this article we will show you, How to write a CASE Statement in SQL Server with example. 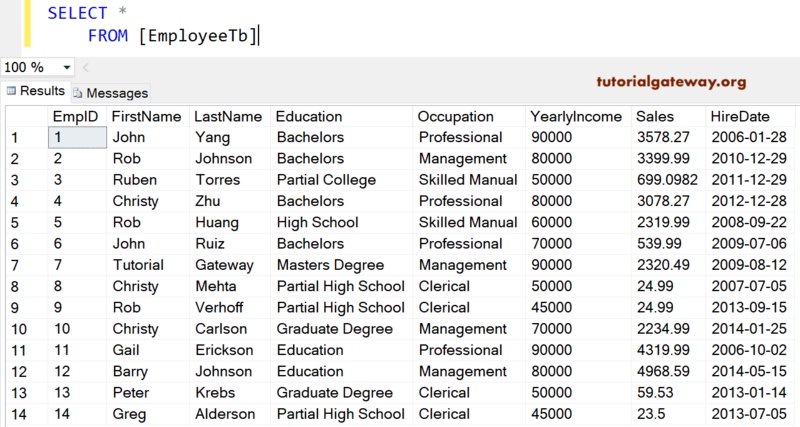 For this demonstration, We are going to use the [Employee table] table present in our [SQL Tutorial] Database. 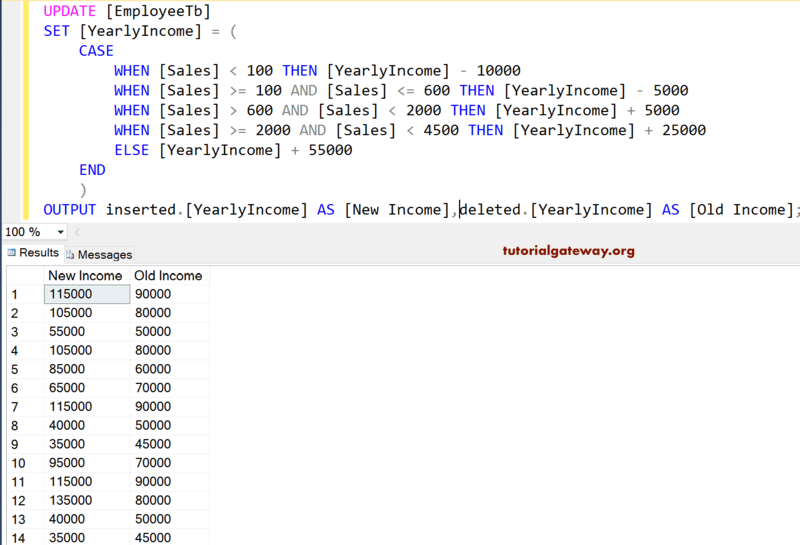 This SQL server case example will show you, How to use the Subquery inside the Case Statement with example. Sales is greater than Average Sales (1970.9055), and if it is TRUE, ‘This Employee is Performing Good’ will be assigned to Remarks Column. 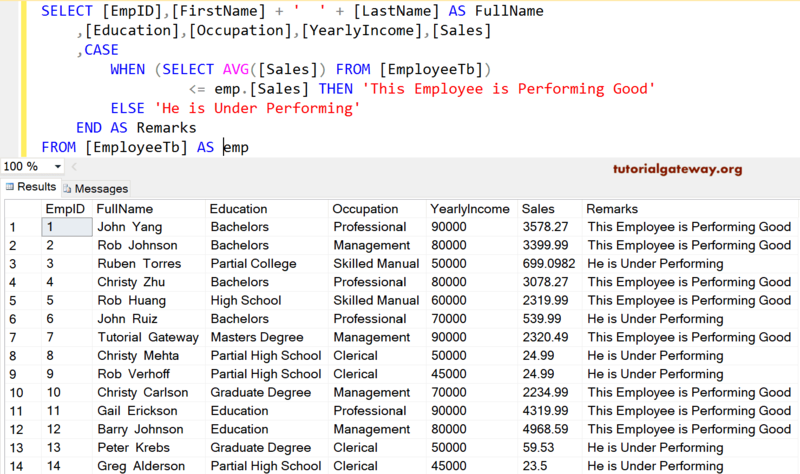 In this example we will show you, How to write a searched Case Statement in SQL Server. 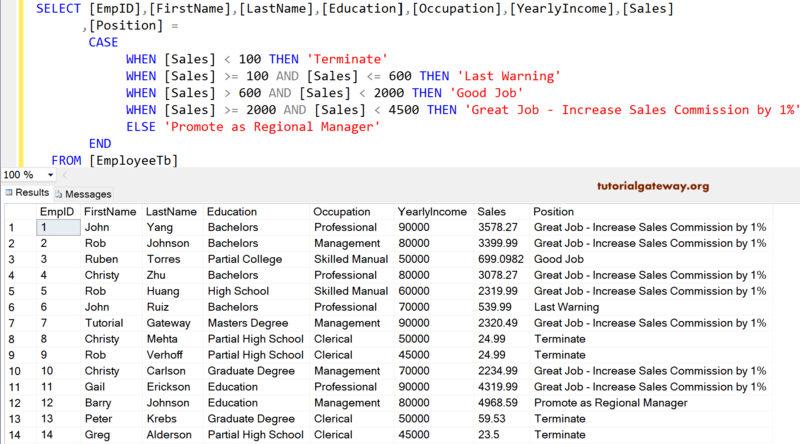 In this example we will show you, How to update the records in [MyEmployes Table] with new values using the SQL Sever case statement. 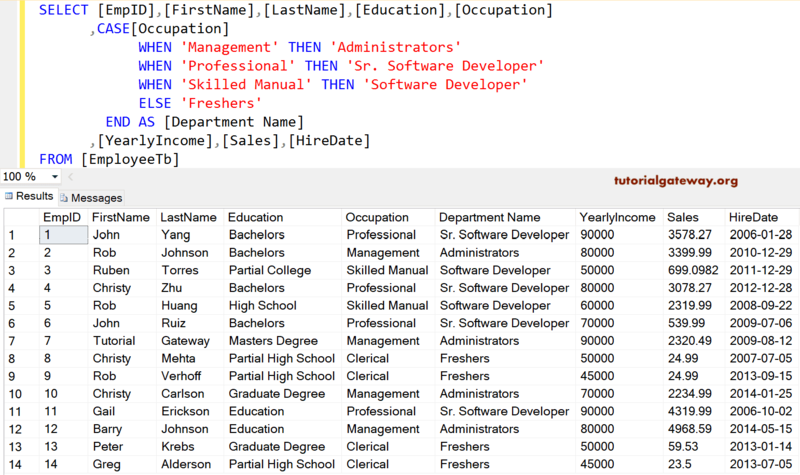 TIP: The OUTPUT clause returns a copy of data that we inserted, deleted, and updated in our tables. 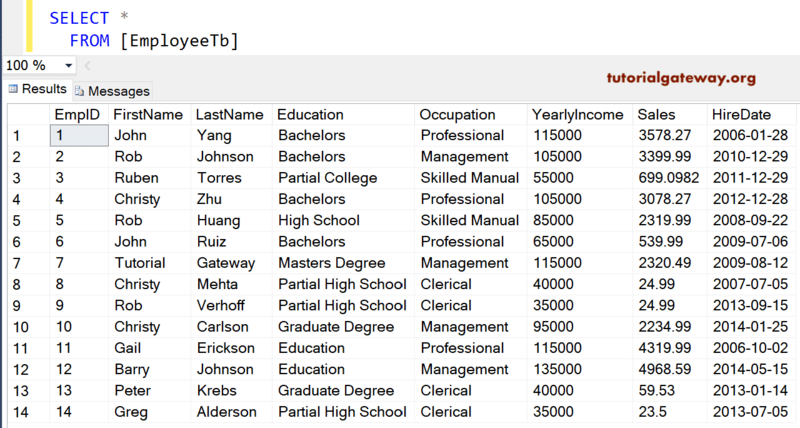 Here, we are going to use the OUTPUT Clause to display the old Yearly Income values and the updated income values at one place. We cannot use the SQL Server case statement to control the execution flow of SQL Statements, User Defined functions, and Stored Procedures. Up to 10 levels of nesting in CASE expression is allowed by SQL server. You cannot use the simple Sql Server CASE statement to check for NULLs. The Case statement performs its operation sequentially, it means when the condition is satisfied then it will stop.